In stock 118 items in stock. TRRS connectors are the audio-style connectors that you see on some phones, MP3 players and development boards. TRRS stands for "Tip, Ring, Ring, Sleeve," which reflects the fact that, unlike a standard stereo connector, this actually has three conductors and a ground. Some devices use the extra conductor for a microphone (like hands-free headsets) or to carry a video signal (like in some MP3/MP4 players). This breakout board makes it easy to add a TRRS jack to your prototype or project by breaking out each conductor to a standard 0.1" spaced header. Hit the ground running with Tsunami, the Super Wav Trigger. Build an air-conditioner monitoring device to collect environment information and store it in the cloud. A hookup guide for the Noisy Cricket Stereo Amplifier - 1.5W. This Experiment Guide will get you started with the wonderful world of mbed microcontrollers. Need to find that next step after mastering the Arduino? This a great place to take those skills to the next level. 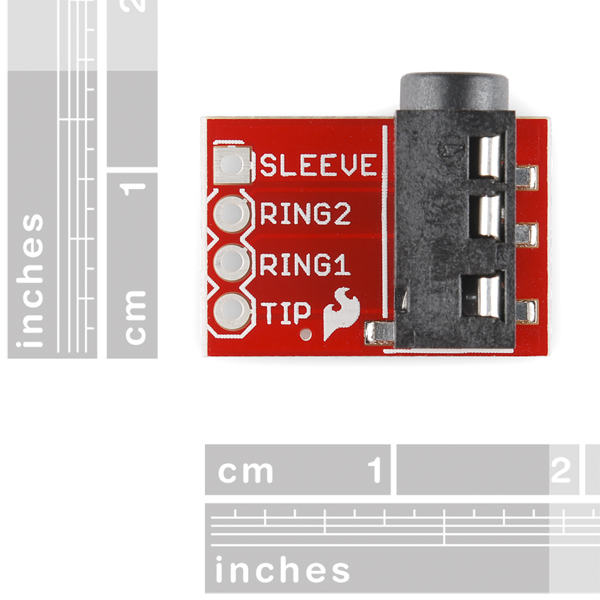 Great, any reason you are not selling the connector without the breakout board ? Screw holes? Where are the screw holes!?! Gah! The lack of screw holes makes it so much harder to use these things in projects (well, my kind of projects). Please please please add screw holes to any breakout...please! I agree that this is useless without mounting holes. they are meant to go in a breadboard for prototyping. 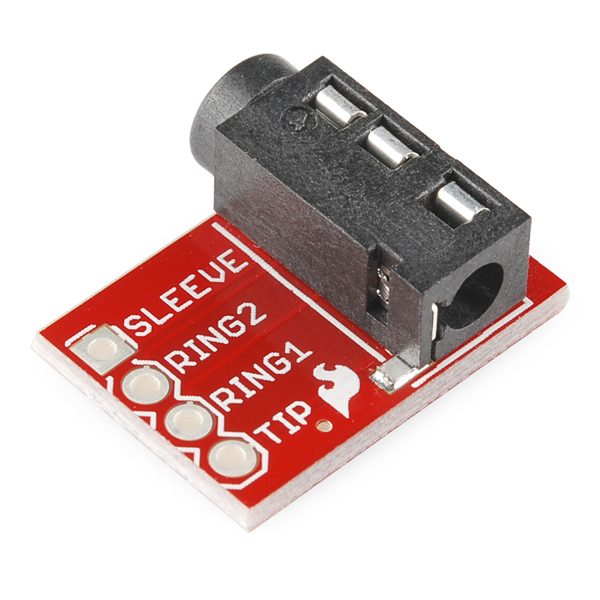 Will this work with a Tip and Sleeve plug? This connector would be great where space is at a premium. Would like to buy some of these w/o breakout. How about it? What is the part number for the connector on this board? I'd like to find out more information on it. Is a datasheet available? We put up datasheets if we have them. What in particular do you want to know? "What is the part number for the connector on this board?" I did some research for you, this one should be equivalent. With a vast supply of cheep ipod shuffle cables out there this would be a slightly noisier but more robust usb connector for a project. It's not quite clear in the photo if the center of the headers are hollow or if they are metal contacts. Can someone please clear this up for me. Thanks! Nice little unit! I soldered it into place without incident. Maybe I'll get to plug the earbuds into it and detect nuclear decay from my newly built bGeigie Nano Geiger counter. This is exactly what I needed and works great! I'm glad that it is a 4 pin connector so I can fully use my headset! 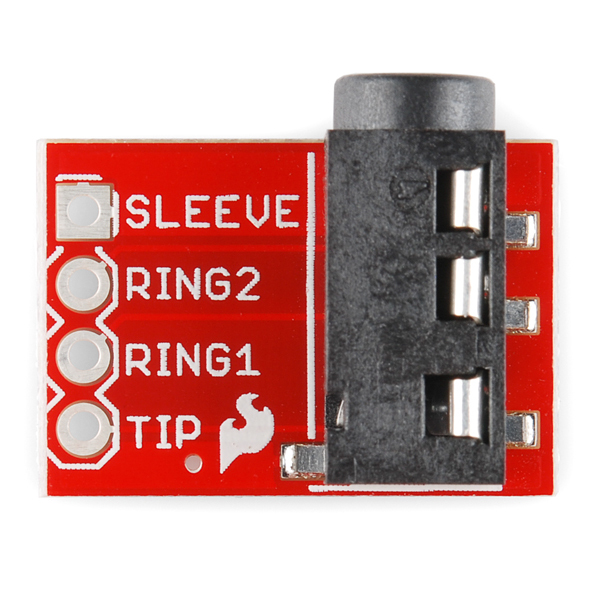 This is the only 4 pin 3.5mm headphone jack breakout we could find anywhere online and its working great. ordered them for final prototyping before soldering direct... this is a pretty basic product, well made and worked flawlessly. not much to say other than it's a high quality jack (nice tight pressure in the jack) and breakout board.